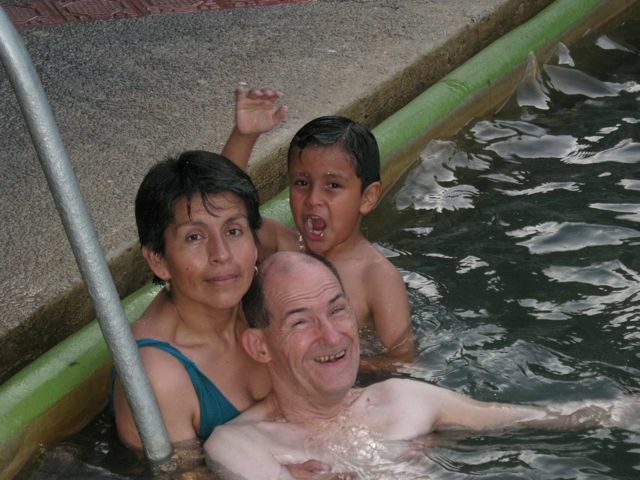 Today we took Isabel (an employee here whom we've become friends with), Elvis and Brayan, her two sons, and Victoria, her mother, to a thermal water park about an hour and a half away. It was suggested that it might relieve some of Victoria's pain. She has cancer. Because our car only seats five, 7 year old Brayan had to sit on a lap. The drive through the mountains was a gorgeous one, as are most drives around here. Housing standards may not be up to those of the U.S., but the natural scenery never fails to delight the traveler. At one point we kept going down, so I said, “Abajo, abajo!”. Brayan picked up on that and he would say, “Arriba, arriba!” whenever we had long stretches of up and, “Abajo, abajo!” when we had long stretches of down. Elvis, Isabel’s 22-year-old son, is studying tourism at the university in Ibarra, so he was our primary guía, though Isabel also knew the way. Elvis also got to practice his inglés with Marilyn, just as we constantly practice our español with Isabel. The place where we went is called Chachimbiro, and it’s just past Tumbabiro. I actually found Tumbabiro on a National Geographic map online. No luck with Chachimbiro, though I found it on our Ecuadorian road map. 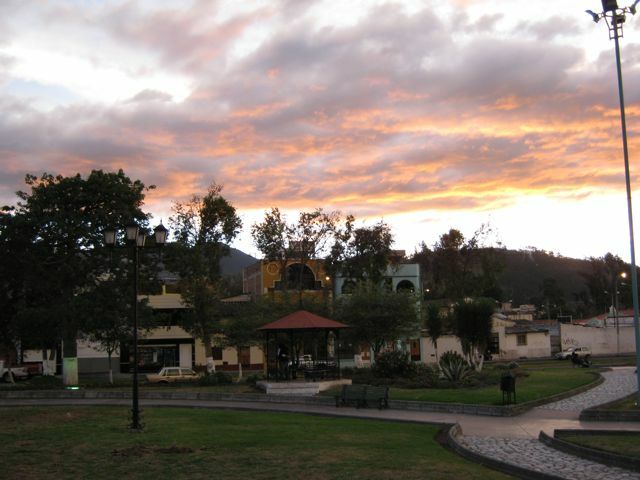 The park is operated by the provincial government of Imbabura (the province in which we live) for the benefit of several surrounding communities. 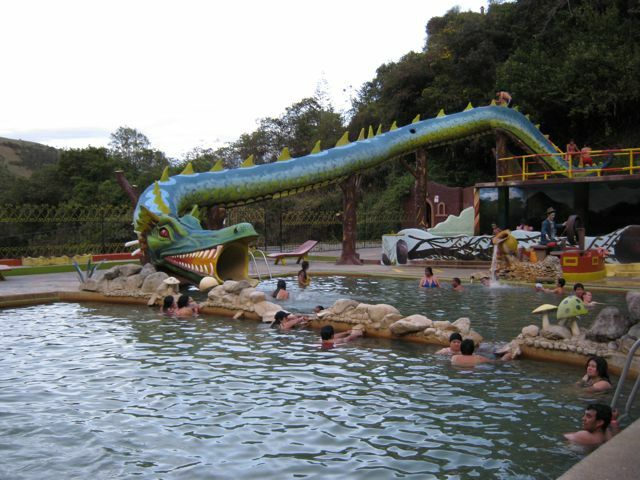 The insides of Volcán Chachimbiro warm the waters that are diverted into piscinas (swimming pools). There were many ways to get to the various pools and we kept trying to find the one with the least amount of steps. We found it. Unfortunately, it led to a pool that was closed. It was getting late, and I wanted to make sure Victoria got in the water, so I told everyone I’d wait up in a restaurant and watch them swim. Marilyn is used to me staying back for the sake of convenience. The others were not, and it took a lot of convincing for them to go on without me. Just then, we spotted a pool that only involved a few more steps, and the workers were kind enough to help, so I got to go swimming after all. There was a huge waterslide camouflaged as a serpent that Brayan and Elvis liked. I was surprised at how reluctant Victoria was to get fully immersed in the water, especially because it was so warm and felt so good. I suspect she may not swim. Or, it could be that she was afraid of increasing her pain instead of decreasing it. We splashed and floated and swam and played for about an hour. When Marilyn would tire of keeping my head above water, she would pass me off to Elvis or Isabel. How relaxing it was to be enveloped by warm waters and almost completely encircled by mountains as we watched the moon and stars appear in a darkening sky. We had brought along some pan dulce (sweet rolls) and jugos (juices), and when we got out of the water, got dressed, and got back to the car, we had a picnic of sorts. There’s nothing like a good swim to sharpen the appetite. The trip back to Otavalo didn’t take any more time than the trip to Chachimbiro had taken, even though it was dark. But, when I think about it, that makes sense. The crookedness and steepness of those mountain roads (not to mention hazards such as cattle on the road and mini rockslides) limit speed day or night. After taking Isabel and her family home, we got back to the Ally Micuy and fell into bed. It had been a tiring day, but one full of fun and new experiences. The best part was that we had gotten to know new friends better. On our walk to church today, Marcello hailed us from his rooftop and asked us to wait until he came down. We met him and his family a few weeks ago. He asked why we hadn't come to his house for coffee Thursday night. He lived in Belgium for a year and wants David, his 4 year old son, and Viviana, his wife, to be exposed to as much English as possible. We had to explain that we were really tired that night. (We knew that was no excuse for not calling, however, and that our bad manners had been exposed.) He immediately invited us to visit after church. What choice did we have? 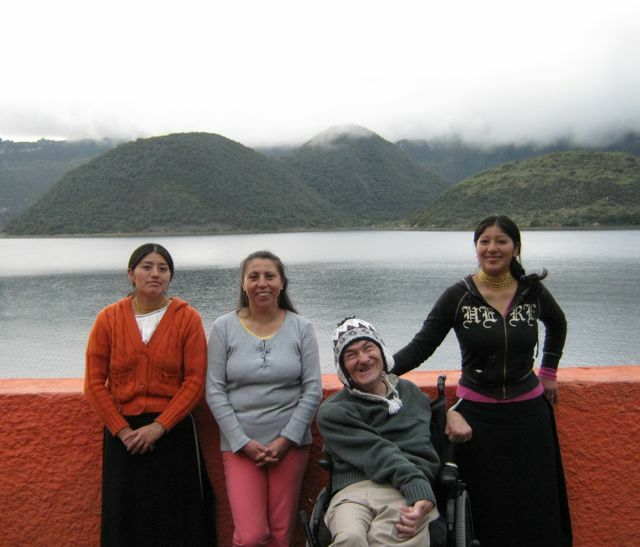 This afternoon we took Margoth, Verónica, and Rosa, three hotel workers, to Lago Cuicocha after they finished work at 4:00 p.m. 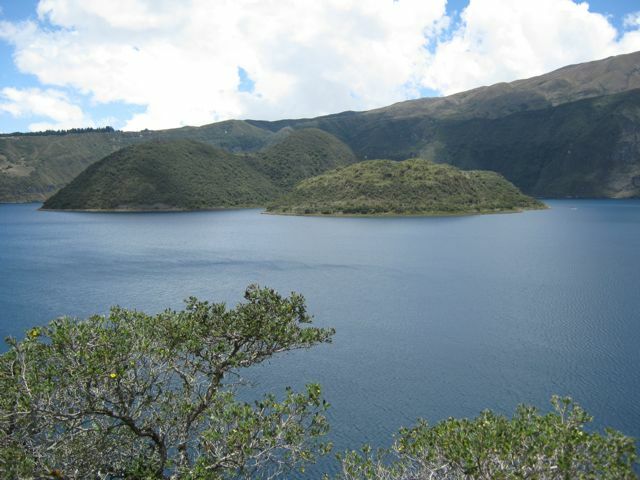 The lake is about 45 minutes away and is in a protected area on the flanks of Volcán Cotacachi. When we got there, we stopped at the information center (which I don’t believe is ever open) so Marilyn could take them on a short hike that she had discovered on our last visit. At first, they didn’t seem to want to go, but quickly acquiesced. I think they had a good time, because they returned talking about the sign indicating peligroso (danger) that they had all climbed through or over. This got them down nearly to the edge of the lake where it was amazingly quiet and peaceful. They also brought back some plant parts. Verónica told Marilyn that one was good for el estómago (the stomach). That might come in handy after the impromptu lunch we had earlier at Marcello’s. We drove on to the part of the lake where there is a boat dock, bar, restrooms, and small tiendas (shops), where we parked and got out. The clouds were low this afternoon, so the lake wasn’t as beautiful as it had been the last time we’d been there, but it was still a pretty dramatic scene. As I said, it’s on the flanks of a volcano and looks like it’s in a caldera (though not the Cotacachi caldera). There are three conical islands in the lake, which I suspect are old cinder cones. I also suspect that the lake is in the caldera of a side vent of the volcano. Margoth, Rosa, and Marilyn wanted to take the scenic boat ride, and Verónica and I decided to wait at the top of the stairs. Unfortunately, the last boat ride for the day had departed before we arrived, so everyone spent the time taking pictures, walking around, and looking at the shops and stalls. We left when it began drizzling. Just before dropping Rosa at her home in Quiroga, a few kilometers away, we stopped and had a picnic in the car of some pan and jugo that we had brought. As we ate, we were treated to a great view of Volcán Imbabura, even though it had many clouds on its slopes. Next, we took Verónica and Margoth home. They are sisters and live with their parents. As with Rosa, we had to be directed to their casa. 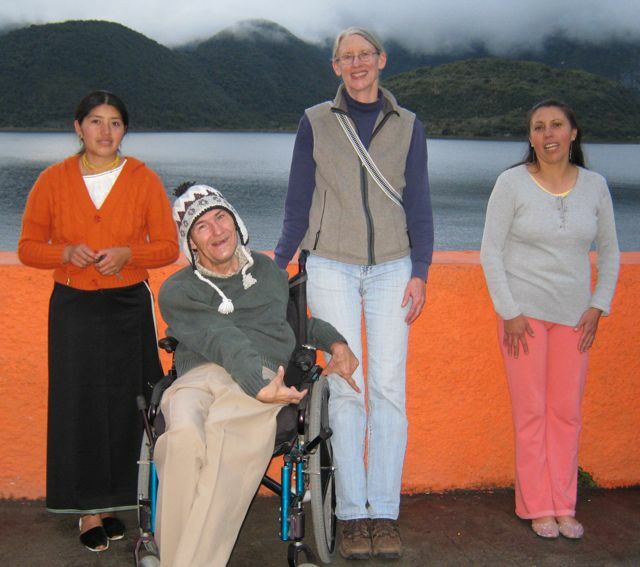 It was up the hill just east, or southeast, of Otavalo – and I mean UP. Ever been on Lombard Street in San Francisco, CA? This was much steeper, and even more crooked, with hairpin curves so tight that they could only hold a few strands of hair. Molly, our car, labored mightily, but got us to our destination after Marilyn gave her a few reassuring strokes on her dashboard. Along the way, there were several great views of Otavalo lit up at night. After saying hasta mañana, we came down the hill in four-wheel drive. We probably should have gone up that way, too. We have decided that, since we had to buy a car for Marilyn’s work anyway, we may as well use it to take friends who can't afford cars on excursions. A minister friend at home has called it our “driving ministry”. If that’s what it is, than the ministry was working smoothly this weekend. Today Marilyn taught her first English class at Huaycopungo. When we drove into the courtyard, it was packed with children from the community who were playing. Marilyn parked about as far from the church as possible, trying not to disturb the play nor to drive through it. We were quickly directed to park next to the church by some of the children – we had parked too close to one of their soccer goals! Fútbol is a national pastime in Ecuador, as it is in many countries around the world, and both children and adults play it every chance they get. The church FEDICE works with in Huaycopungo feeds many children each day. It also provides a safe place for children of the community to play each afternoon (assuming Marilyn does not hurt any of them on her drive across the area three times a week). This church has really become a community center. First, the car attracted mucho attention, especially from the younger children. The crowd grew substantially when Marilyn got my wheelchair out of the back. It swelled even more when Marilyn helped me get into my chair. I wouldn’t be surprised if there were 50 pairs of curious eyes on us by the time I was comfortable. In the classroom, the children who had registered for the class were pretty excited, and therefore pretty chaotic. It was a good thing that Blanca, José Manuel, and the pastor of the church were there to introduce Marilyn and the class, which helped to settle them down. It was still pretty noisy. The classroom was at the end of a hall and children were playing in the hall, fairly lustily. You could close the door, but it didn’t help much because there was a large opening for an absent pane of glass above the door. Still, the students were remarkably attentive once they settled down, despite the outside noise. Marilyn taught some greetings first, such as, “hello”, “good morning”, and “good afternoon”, and things went pretty much as expected. Pronunciations had to be repeated often. Then Marilyn started to teach the numbers 1-15, and we got quite a shock. The students fairly ripped through these without any hesitation. Had they all had experience with inglés numbers in the mercado (market)? Had they learned these in some English class in school? We don’t know the answers yet. Next came a song. Marilyn explained that this was a song for niños (very small children), while the class was made up of jovens (youths probably 11-13). However, it would help them remember their numbers. They all seemed to enjoy learning it and singing it, including the hand movements. In fact, some were still singing it after the activity ended. To end the class, Marilyn taught them how to say, “goodbye”. She had them leave the room one by one, each stopping to shake her hand and say goodbye. The first class was over, and we started preparing to leave. However, José Manuel, a community leader in Huaycopungo, had other ideas. He asked Blanca and Marilyn if Marilyn could teach a second class to youths who were a little older, say high school age. Unlike the first class, this class would be composed of students with widely varying degrees of English language ability. Marilyn said she could try. José Manuel then left for ten or fifteen minutes and came back with a crowd of young people. The classes were explained to them and they were given an opportunity to sign up. As with the first class, if they completed the 30 hours of instruction, they would be given a certificate from FEDICE acknowledging the achievement. The certificate, in turn, would be helpful in colegio (high school). At the same time, Marilyn and Blanca were evaluating the English-speaking abilities of the potential students. Three or four had very good skills, while some didn’t have many skills at all. This class would clearly be a challenge for Marilyn. When we woke up this morning, we thought Marilyn would be teaching one class three times a week until May, when she would add another class at the nearby community of Tocagón. Before we even went to cena (evening meal), Marilyn was teaching two classes (with 21 students in each) three times a week and we were not certain where Tocagón’s students would fit in. The weather is not the only thing that can change quickly in the Andes. At breakfast, Isabel asked if we had felt the temblor last night. Temblor? ¿Que es temblor? Well, folks, a temblor is a small terremoto (earthquake). No, we hadn’t felt it. We slept right through it! Our first earthquake! At least, the first earthquake I’ve been in. Isabel said she didn’t feel it, but it woke up Don Jairo and Yolanda, his wife, around 3:30 a.m. Later, Yolanda told us that the chandeliers were swaying. 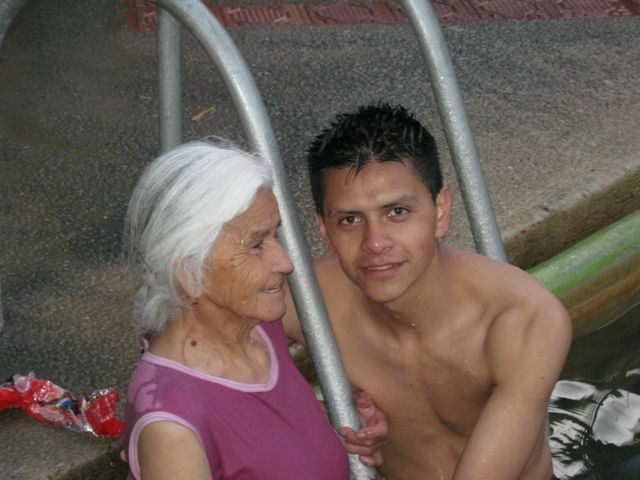 Don Jairo said that some people in Otavalo felt it and others did not. I didn’t find anything on the web, but I don’t doubt that it happened. It was probably too small and localized to be noted on the web. I did find some shaking recorded in La Paz, Bolivia on the proper date, but the wrong time. In the afternoon, the weather was nice so Marilyn took me for a ride in the mountains. Her ANETA driving instructor had taken her to a couple of places that Marilyn knew I would like. Sure enough, I really enjoyed the drives. The second was to an overlook of Otavalo. Breath-taking! On the first drive, we saw a giant passenger jet at a hacienda – with no runway! They must have gotten it up there in pieces and reassembled it. After that, we drove to Ibarra to get some calcium tablets. Naturally, I had to have a helado, though it wasn’t from Rosalia Suarez. For me, Ibarra has come to mean ice cream. After cena (evening meal) on Good Friday, we were passing through the lobby, where some of the employees who live here sometimes relax with their families. There weren’t any children around, as is normally the case. We asked where they were, and were told they were at the procesión. Thus began our Easter weekend activities. We asked what the procesión was and were told that it was a Catholic parade of sorts that commemorated the death and resurrection of Christ. We asked when it started and were told 8:00 p.m. (it was now just after 8:00 p.m.) We asked if we could get to it by walking down Bolivar, one of two streets we normally take to walk into town, and were assured we could. So we determined to throw on a jacket and go. We got to an intersection on Bolivar that was barricaded as the procesión was passing by. Besides procession, another meaning for procesión is parade. And, being from New Orleans, I immediately sensed a parade-like atmosphere. As we looked up the street, we saw the whole two lanes totally filled with people who had already passed by all the way to the top of the hill, around 4 or 5 blocks. There were people marching or walking, some carrying candles, some with masks, some with painted faces, and there were onlookers, such as Marilyn and myself. They even had “floats” and bands, though only one of each. The “float” was a lighted statue of Christ carrying the cross. It was carried by ten people and came after the first main group of people in the procesión. After the next group of people came a brass band. They were playing a tune that was neither joyful nor mournful, but sort of meditative. Last came a third and final group of people. They all filed by a lighted stage to our right. The living tableau on stage depicted Simon of Cyrene taking up Christ’s cross. Many of us are familiar with living nativity scenes at Christmas. I think that would best describe what the stage we saw looked like. Upon closer inspection, I noticed the words, “V Estación” and realized that this depicted the 5th station of the cross in the Catholic tradition. Marilyn asked if I’d like to join the procesión and I said yes, so we joined the rear, with several baby strollers and another person in a wheelchair. We were not far behind the band, so we got to hear them play the same two tunes over and over. It was not irritating, however, because the music was so meditative. Indeed, the music gave a solemnity to the procesión that otherwise may not have been present. The only thing that really disturbed the solemn mood was the occasional too sensitive car alarm when someone brushed against a parked car. The procesión did not move fast, as it stopped at each station of the cross, ten more in all because, unlike the traditional 14 stations of the cross, there was an additional one depicting Christ arisen on Easter Sunday. These, like the first we encountered, were usually lighted stages set up at intersections. Each station was sponsored by a civic organization or a city department. Our joining the procesión made Marilyn think of what it must have been like on the original Palm Sunday. Some people no doubt began the walk with the intention of accompanying Jesus to Jerusalem. Some no doubt joined because they believed in Christ. Some probably joined because of the majesty or because it “seemed like the thing to do” that day. Some, like us, joined to see where it would lead and to experience the solemnity of it. I never expected myself to be in a religious procession of any kind. I had read about Catholic processions, as well as Muslim processions, and sort of thought of them as quaint anachronisms. I was a little surprised that I could feel the gravity of the occasion, because I’m not a particularly religious man. As we walked along familiar streets, they looked quite different because most businesses were shuttered. Those that were open were usually eateries of one kind or another. One had a television facing the street, which was showing scenes of Christ’s crucifixion, probably from a movie such as The Last Passion of Christ. Because of the clarity of the picture, we assumed it was a DVD. However, if it had been a TV broadcast, that would have been quite a coincidence. The procession ended at one of the Catholic churches in town. It didn’t so much end as it quietly dissolved, with people quietly walking to their homes, or to their cars if they lived farther away. The Catholic Church where we dispersed is lit up each night with exterior lights, whose colors are purple, green, and gold. It’s very pretty, but I can’t help being reminded of Mardi Gras. During the worship service on Easter Sunday, Pascua (Easter) was only mentioned in passing. As you may expect, this was very different for us, since we come from a tradition that celebrates Easter whole-heartedly as being the basis of the Christian faith. There was another reference to Easter during the service, however. During communion, they projected movie scenes of Christ’s crucifixion onto the screen normally used for the words of praise songs. I can’t speak for Marilyn, but it made me slightly uncomfortable to eat the bread and drink the juice (symbols of Christ’s resurrection) while watching spikes nailed into Christ’s hands. The experience brought to mind an exhibit of religious art from South America that Marilyn and I once attended in Austin. It taught how the Catholic priests from Spain used art to educate South Americans about the Christian faith. As they say, a picture is worth a thousand words, and that was the concept behind creating all this religious art. When I watched movie scenes of Christ suffering, as I was participating in communion, it reminded me that images are still a powerful form of communication. I don’t know how many people are literate here, but I think it’s a large majority. However, I suspect some may be illiterate. Things like these movie scenes must be valuable tools of instruction for them. In my case, I’m not illiterate, and the movie scenes brought things into sharper focus for me. 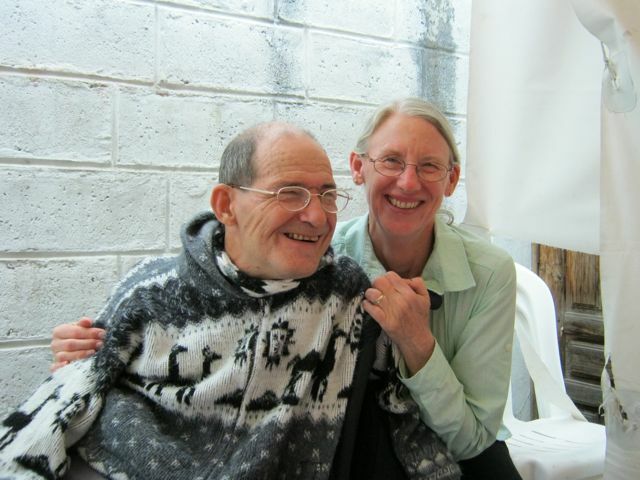 We didn’t have any expectations for Easter in Otavalo. That’s a very good thing, because we would surely have been disappointed otherwise. Instead, we got to celebrate Easter in an unaccustomed manner, with friendly people, and in ways that were sometimes profound. Every morning I thank God for hot water in my shower. And then I revel in its warmth that heats me to my core. The weather here has been delightful: mild during the days and mild at night. The rising sun shines into our room through our large bank of three windows, warming us. In the afternoon, when sometimes it’s almost too warm, our room is cool. At night, we go to bed early and stay warm under the covers together. There is no heat in the hotel, so when our room is cold, we put on more clothing. It’s a concept that we’ve not utilized much at home in Texas. Life seems relatively simple here. I don’t have to cook; I don’t have to clean. But I do have to work on my communication skills in Spanish; I do have to prepare for my driver’s license exam; I do have to think through my classes that I will soon be giving in English. It’s nice to be able to walk to most everything I need and do. And when the car is working and reliable, we will be able to drive on weekend trips to nearby mountains and waterfalls and lakes. Not everybody who lives here has such a simple life. Isabel is a single mom whose mother has incurable cancer. Victoria is doing pretty well, but often, her medication is not strong enough for her pain. Recently, she made a trip to the emergency room of the hospital across the street, only to find there were no available beds for her to stay in so she received a different medication and was sent home. Isabel’s son is a handful. Unfortunately, she is at work until 4:00 p.m., leaving him alone with his grandmother after school ends around noon. He does not always listen to his grandmother’s instructions. Paulina holds down two jobs (one as an elementary school teacher and another as a hotel employee) in addition to living in the hotel with her young daughter to make ends meet. She is often very tired by the end of the day when patience is harder to come by. Jairo manages both the hotel and a restaurant about five blocks away. He has good staff under him that take care of daily operations, but he only has a maximum of 24 hours a day to make it all work. In addition, because of his kind heart, he is often pulled in different directions helping others. His biggest challenge is making the two businesses profitable so he can both pay his staff and continue to improve what a few years ago was a hotel that had been let run down. I sometimes see indigenous women on nearby streets who appear to be homeless. They are often carrying heavy burdens. Some beg for money; others sell candies, or grapes, or woven items. For change and dollar bills, they somehow eek out a living. And I wonder how the merchants with families in the mercados can make a living selling inexpensive items to Otavalo residents and to tourists. I have learned that most people here work 6 days a week. Sunday the parks are filled with people playing soccer or volleyball, talking with friends or lovers, riding horses (at least at one park), playing with their children on playground equipment. Yet, this doesn’t really sound a lot different than the lives people live back in the United States. Many are unemployed or underemployed there. Families have troubles and pain and sorrows. Sometimes help is close by; other times it is not. There are homeless people begging at street corners in the U.S. also. It appears that for most of us, what we are given in the way of a life, we accept and go about our business. For some of us, it is easier; for some, it seems harder. Yet, whether one has a life of ease or hardship, there are times of difficulty. The people here in Ecuador laugh a lot. The pressures at the job seem less than in the United States. Folks talk to each other and share stories. Many people are merchants and don’t answer to a boss. Family and friends are important and it seems that people take time to spend together and to laugh even though they work 6 or 7 days a week. We are glad we are here and hope we can always remember the importance of the relationships we have with others and to take time to laugh.